Would you think this kettle was made in the UK? When I surveyed our followers on Instagram with this image over 30% of them thought that this kettle was made in the UK. So if you did too, you’re not alone. 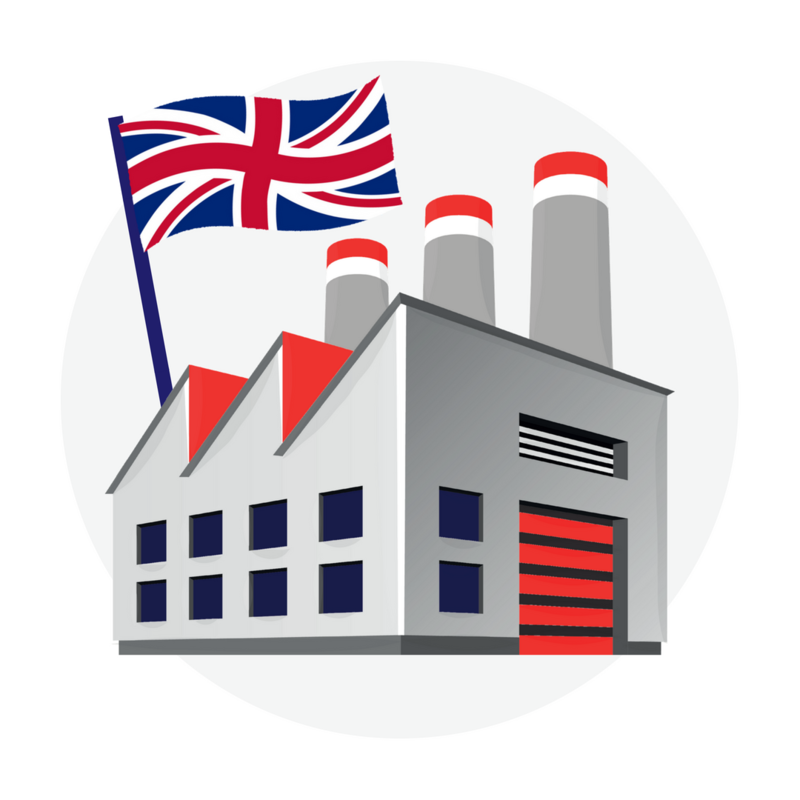 Brands often use terms like ‘designed in the UK‘, ‘developed in the UK‘ or in this case, ‘engineered in the UK‘ to give the impression that you are buying a product that is manufactured in the UK. It’s an ongoing problem, and something that I call Fake it British! Previous examples that I have uncovered can be seen here, here and here, but there are many more that I’ve not even documented. 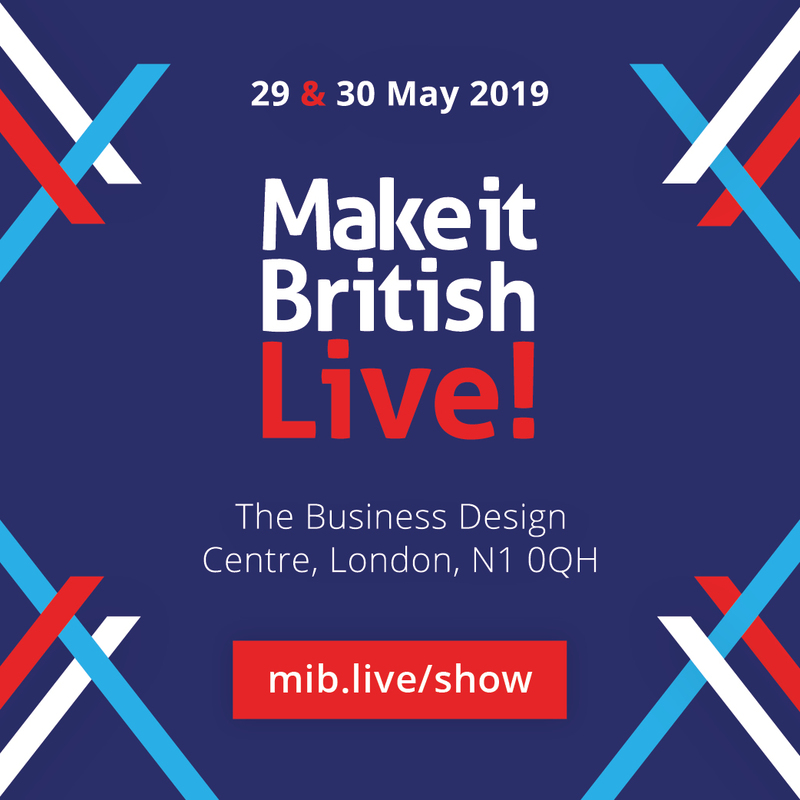 Because it has been proven that many consumers actively seek out products which are made in the UK, there is a great value in promoting something as ‘British’. But if labelling and packaging is not clear, shoppers could end up finding themselves with a purchase which is not all that they first thought. 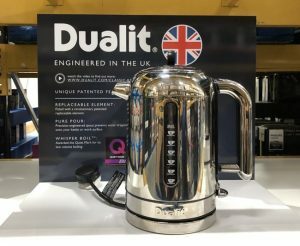 I couldn’t find a ‘made in’ label anywhere on this Dualit kettle but there was a Dualit toaster sitting alongside the kettle in store and that was proudly announcing that it was Handmade in the U.K. so why not use the same message for the kettle? I’m still waiting for Dualit to get back to me to confirm the kettle’s country of origin. 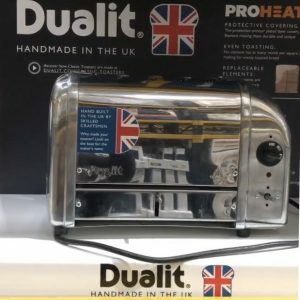 I’ve no doubt that both kettle and toaster are quality products, but if the kettle isn’t made in the UK it is a real shame that Dualit had to resort to this. The fake it British marketing detracts from their fantastic toasters which ARE made in Britain. I’d love to hear your thoughts on this, or examples of any products that you have seen in stores that use misleading marketing to dupe consumers into thinking they are buying a made in the UK product. ← How valuable is a Made in Britain label to your brand? I stopped buying Dualit after being told a stick blender with a burnt-out motor couldn’t be repaired. The whole reason I liked their products was sturdy British engineering and the fact that they claimed to offer a repair service. Turns out that was all fibs too, and I wouldn’t be surprised if that blender was Chinese. It was lighter than expected, all fake-chromed plastic, and plainly far too feeble for the price. I could have bought five less swanky brands for the price of that one, and would have had five times the use out of them. That’s the opposite of the way a premium ‘British’ line is supposed to work. I bought a Dualit kettle in 2013 and I asked them where it was made. They e-mailed me back, telling me it was made in China. Absolutely makes my blood boil that we have all these things “proudly designed/thought up/imagined in Britain”….. only to be shipped off to anywhere cheap to be made. I refuse to buy any makeup that is made in China (unless it sneaks through without me noticing – very, very rare). But Collection 2000 are guilty of it all the time, (along with the designed in Britain nonsense) and you will notice often that Boots Christmas items are suddenly not made in Britain but in China/Thailand – think Soap and Glory – mascara/lipgloss in sets are Chinese, yet usually made here, slipped in with the rest of the British made items. I’ve also noticed that White Company’s scented diffusers have now been shipped to China (and the scent payoff has gone with it). Sorry, could rant on this one for days! Yes, I have bought this exact kettle and matching toaster, saved for ages as it is quite pricey, but do want to support British high standards, quality, industries and jobs. This would be very disappointing to find the British flag (or any flag from the union as I live in Scotland) ended up to be fake insignificance. This would be, very misleading indeed as I deliberately spent more money to supposedly buy British! A simple rule of thumb is, unless any product actually say ‘ Made (or produced) in the UK’ then it is NOT made in the UK. What annoys me over the last few years is that most items made in the UK are labelled ‘Made in the EU’, while items from Germany proudly state Made in Germany as with France, Italy etc, which, (don’t get me wrong ) i also like to purchase good quality German or french goods, if there is not a British alternative. I wouldn’t believe anything is made in the UK unless I specifically see the words “Made in the UK”. Sad but true. Several months back I bought a Fogarty mattress protector and was fooled by the fact it said on the packaging “The British Allergy Foundation Seal of Approval”. Inside on the label, after I washed the product I noticed it said “made in China”! Very frustrating. Another reason I thought the mattress protector was British made is that they do clearly mark duvets as being made in the UK. On another occasion I noticed Clarks Shoes advertising in big bold letters inside one of their stores “Quintessentially British”. When I asked the sales assistant if they actually had any British made shoes they were unsure and he asked the manager of the store who replied “no”!! 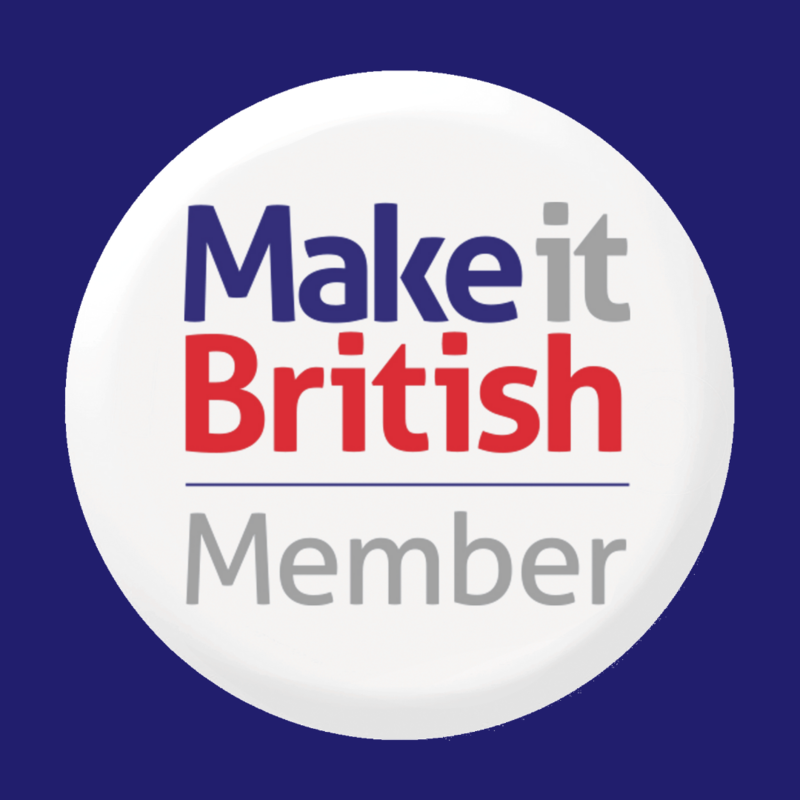 I just keep looking and keep checking for British made goods, and the Make it British website has helped a lot in finding British manufacturers too – thank you!